More About the Weather Underground “Days of Rage” (Repost) | can i just finish my waffle? Bill Ayers, Bernadine Dohrn, and the Weather Underground. “America is not a just and fair and decent place,” “It makes me want to puke.” — Bill Ayers said in 2001. Even if Barack Obama didn’t make his appearance in the lives of Bill Ayers and Bernadine Dohrn, this would be a fascinating story for a person such as myself who is a follower of true crime. Bill Ayers says in his memoir that most of the bombs the Weathermen were blamed for had been placed to only do property damage. Maybe most but certainly not all. In 1970 in San Francisco a pipe bomb attributed to the group killed one police officer and severely hurt another. An accidental explosion in a Greenwich Village town house basement killed three of the radicals. Survivors later said they had been making nail bombs to detonate at a military dance at Fort Dix, New Jersey. Note: I wonder if Mr. Ayers is familiar with the felony murder law. I think he would be since fellow weathermen, Kathy Boudin and David Gilbert, were convicted and sentenced to life in the Brinks robbery based on felony murder. Three days after the townhouse explosion, Bill Ayers and Bernadine Dohrn skipped a court date from the Days of Rage case and went underground. Initially, fiery tape recordings were sent to reporters. Over the next decade, the Weathermen claimed credit for 25 bombings but eventually the movement broke apart, and Dohrn and Ayers began a life together in New York, still underground. Ten years later, Dohrn and Ayers finally turned themselves in, in Chicago. Federal bombing conspiracy charges had been dropped because of improper FBI surveillance. Local assault and battery charges remained against Dohrn. She was fined $1500 and placed on probation. She remained defiant. “Resistance by every means necessary is happening and will continue to happen within the United States as well as around the world, and I remain committed to the struggle ahead,” said Bernadine Dohrn. In an August 22, 1996 PBS interview, it was stated that teaching is the central fact of Ayers’ life. A full professor of education at the University of Illinois at Chicago, he’s written four books. With his love of teaching and his distrust of bureaucracy, it’s not surprising that Ayers has been deeply involved in school reform in Chicago, and the effort to decentralize this troubled urban school system. Dohrn is also heavily involved in reforming a major social system. Chicago has often criticized juvenile court. On the staff of the law school, at Northwestern University, Dohrn heads the Children and Family Justice Center. Her work gets high praise from an unlikely supporter, the judge who oversees the juvenile court in Cook County, Chief Judge Donald O’Connell. But the past does intrude on her work. Dohrn has a law degree but cannot practice. She was denied a license in part because of a seven-month jail term she served after refusing to testify before a grand jury. The jury was investigating a botched robbery of a Brinks truck in which a guard and two state troopers were killed. Weatherman Kathy Boudin was sentenced to life for the crime (or 20 years to life). * It happened a year after Dohrn came above ground, and she has denied any involvement. There are still those who haven’t forgotten or forgiven. Northwestern Law School Professor Dan Polsby is one of them. “There were many acts of domestic terrorism. It seems to me that in the world as we know it right now. He can’t simply walk away from acts of domestic terrorism and say, well, okay, that was a long time ago. It wasn’t that long ago, for one thing, and for another thing, it has never been apologized for, and it seems to me that repentance has to proceed forgiveness and not come sometime later,” says Professor Polsby. Dohrn and Ayers do not react to those who say they are still outside the system any more than they do to those who say they sold out, but the years have made a difference. Their family is as important as their activism now. It was their children that brought them out of the underground. They have raised three teenagers–middle child Malik Cochise is named after Malcolm X and a 19th century Apache chief. Their oldest, Zade Atheola, is named after a Black Panther killed in a shootout with police in 1973. Sixteen years old at the time of the interview, Chesa, Kathy Boudin’s and David Gilbert’s son, has been raised by Dohrn and Ayers since his mother and his father were jailed when he was 14 months old. Weathermen Boudin and Gilbert were convicted on felony murder and robbery. Also central is the desire to make a fundamental radical change in society. Would they do it all again? They say, absolutely. And yet the meainstream media continues to turn a blind eye to Ayers and Dohrn. It’s sickening. why is everyone so wound up over one person that really can’t do anything? Because Barack Obama is an uppity African American who had the nerve to beat out the PUMA Goddess, St. Hillary. Because of that, everything that Obama does is in league with the devil, according to these old white women. Wright, Ayers and ACORN. He’s a liar and a very scary guy….wake up America. Obama and his wife has an agenda for America for CHANGE….but I don’t think it’s the change everyone thinks it is…he is a left wing radical and THAT’S his agenda for America. I wonder when the media will explore his affair with Vera Baker. 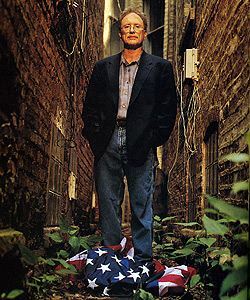 At the same time Ayers was in a Chicago alley desecrating the flag, he and Barack Obama were serving on the board of the Woods Fund together: PolitiFact | Obama served on board with Ayers. Are we really so superficial that we play electoral “math” like this? John McCain was a POW half a century ago. Barack Obama served on a board with a guy who posed for a cover photo standing on an American flag. So McBush becomes the only qualified guy to be President? If you’re so big on “the company they keep” what about the endorsement of Colin Powell today? Or do you label Colin Powell an “American-hater” too? The positive direct unequivocal endorsement of Colin Powell — coupled with Powell’s denunciation of McBush and his tactics — ought to more than offset these negative insinuations you’ve tried to make about acquaintances of Obama. It does provide a little balance, but not enough. There are way too many questionable characters that Senator Obama has sought out for support and for long-time alliances for one endorsement to make much difference in my mind. Since when is a mere acquaintance an “alliance”? You have this distorted view of Barack Obama walking with arms linked to Bill Ayers, Louis Farakhan, Jeremeiah Wright, etc. Have you SEEN any of them involved in his campaign? No. Have you HEARD of any of them involved in the campaign? No. And this doesn’t quell the worries you have about the Obama Boogieman? Sad. But predictable. This endorsement will be rationalized by all the McBushies and the PUMAs — but it’ll carry lots of weight with the undecided voters. Colin Powell is a military hero with a BRAIN, the only leader with character in the entire Bush administration. A lifelong Republican, a long-term friend of McBush… and he’s voting for Obama. Mcush has been on life support for a week now…. but he’s flatlined. It’s just an endorsement. Louis Farrakhan endorsed him as well. An endorsement is one man’s opinion. In a 2004 interview with the Chicago Sun-Times, Obama mentioned three men as his spiritual advisers, Rev. Jeremiah Wright, Father Michael Pfleger, and Illinois State Senator, James Meeks. He is quoted as stating that these three men helped him keep his spiritual compass set. He appointed James Johnson, former CEO Fannie Mae, for his VP vetting committee. Father Pfleger (who is a Louis Farrakhan ally) whose church in Chicago has received at least $225,000 in federal grants and until recently was connected with the Obama campaign, which flew him to Iowa to host an interfaith forum. His political career launched by Ayers and Dohrn. So, yes, they are or have been involved in his campaign. Except for Farrakhan and he thinks Obama is the Messiah. “His political career was launched by Ayers and Dohrn.” IN 1995. MAYBE. Have you ever been to a political fundraiser in someone’s home? Happens all the time. Not that big a deal. Often it’s in a person’s home who has a big enough home to make the fundraising lucrative. I’ve been to such fundraisers where the homeowners don’t even really know the candidate and vice versa. It’s a friend-of-a-friend-of-a-friend deal. And it was 1995 — more than a decade before Obama launched his presidenitial campaign. And Pfleger and Wright being on Obama’s “spiritual” team? Do you really think ANY candidate’s “spiritual team” runs a campaign? They don’t even get NEAR the campaign’s decision-makers. Why don’t you check out Obama’s babysitters? Or the guy who servives the Obama auto? (Notice the Obamas have one bvehicle, not 13.) They have about as much influence on Obama as any of the people you’ve tried to tie to him. This is an anthill that you’re trying to turn into a molehill and, if you’re lucky enough to do that, you got two weeks to convince America that it’s a mountain. Good luck with that. Especially when it’s based on a lie. Pingback: William Ayers and Bernadine Dohrn – Digging a Little Deeper, Who is Chesa Boudin? « Can I Just Finish My Waffle?